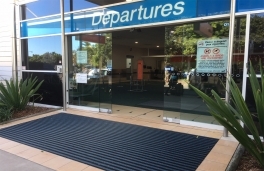 Frontera is the ultimate cost effective entrance matting. Designed for use in commercial applications Frontera's heavy duty carpet inserts provide excellent scrapper qualities while the grid design allows dirt to fall away beneath the surface where it can be cleaned up later during normal maintenance. Frontera is a registered trademark of Maydel Extrusion Industries Pty.Ltd. and is part of the Flexi-Mat range.